Armin D. Cate – a retired Senior Special Agent with 35 years of security experience as a senior government official with the Department of Homeland Security. 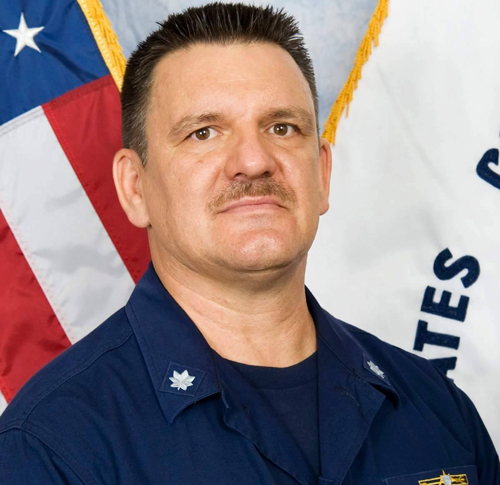 He had a dual track career with both as a Senior Special Agent with Immigration and Customs Enforcement (legacy U.S. Customs) and as a Commander in the United States Coast Guard Reserve. Since retiring from ICE in 2011, he has conducted anti-piracy ship surveys for vessels operating in the Nigeria Delta and led executive protection details for a Fortune 100 CEOs in Mexico, Colombia, Brazil and Russia. He has conducted domestic and international vulnerability assessments for critical infrastructure, schools and private communities. He has developed proposal for multi-million dollar border surveillance projects including developing a “sterile” railway crossing on the US/Mexico border and upgrading the Mexican Air Defense Command. In 2012, he was a consultant to the transition team for Mexican president Pena-Nieto on border enforcement and intermodal cargo security. He is also a consultant for several manufacturers of innovative products including Thermo Scientific. He has served as a security consultant for critical infrastructure, schools, churches, gated communities and condominiums. Key positions held include Chief of Response and Senior Investigations Officer, Marine Safety Office Miami; Chief of Intelligence Coast Guard Unified Command with responsibility for all South Florida Seaports and Critical Infrastructure; Commanding Officer, Sector Miami Logistics Command; Interagency Liaison Officer JIATF-South, Key West; Executive Officer Coast Guard Reserve Unit, U.S. Southern Command Miami, Florida; Commanding Officer of Coast Guard Reserve Port Security Unit 311, Los Angeles, CA. Some of the highlights of his career included serving on the personal protection detail for President George W. Bush, working on teams that directly contributed to the removal of two notorious dictators and the detection and apprehension of a suspected Al Qaida operative in the United States. During his career, he served in leadership positions in a operational, advisory and training capacity where he led boarding teams that conducted hundreds of law enforcement missions on the highs seas and in U.S. waters including the disruption of the attempted high jacking on two separate occasions, the interception and search of ships carrying hundreds of tons of cocaine and marijuana to the United States; flying on numerous sorties conducting the airborne interception of drug laden aircraft in Central and South America and the Florida Straits; piloting aircraft engaged in the surveillance of suspected smugglers in the United States. He has led complex international investigations that resulted in the seizure of tons of cocaine and marijuana at international seaports, airports, land borders and on the high seas as well as the disruption of human smuggling operations. He has conducted Port Security surveys at both U.S. and overseas ports implementing the MTSA and ISPS International codes. The implementation of his recommendations at the port of La Haina, Dominican Republic brought this from one of the least secure to become a model port. Exercise Designer and International Trainer in Caribbean and South America for All Threats/All Hazards training to partner nations military personnel; He has participated in numerous natural disaster recovery operations and has led response and clean up teams for several major environmental disasters. Her has served on design teams to plan, construct and set up several command centers in the U.S. and internationally. He has served as the senior advisor for a international maritime military assistance program for six Caribbean and Central American partner nations; he has designed and led major international joint/combined operations including Operation Harborcraft which served as the genesis of the US Southern Command’s Directorate of Counter Narcotics. He has served in many intelligence related capacities and has conducted both undercover and covert operations in high threat environments. He has developed and implemented human intelligence programs and has years of experience as a confidential source handler and interrogator. He is a veteran of the 101st Airborne Division including Air Assault, Jungle Expert and Reconnaissance and Commando qualifications. He has been a public speaker for the Office of Personnel Management and the Coast Guard on counter- terrorism in the maritime zone. A 35 year veteran with the Department of Defense as a Reconnaissance Sergeant at the 101st Airborne, the Department of Treasury as both a US Customs Air Interdiction Officer and Criminal Investigator and the Department of Homeland Security as a Commander in the United States Coast Guard Reserve and as a special agent with Immigration and Customs (ICE) Homeland Security Investigations (HSI). NotAtMySchool.org is a proposed 501c3 seeking to develop and promote prevention strategies to halt violence at schools long before it happens! Empowering students to anonymously report violence promoting speech, actions and social media postings at schools is one of the three pillars of this pioneering prevention strategy. Other two key components are: a Train the Trainer program that assists schools in establishing “Positive Peer Pressure” by empowering student leaders how to use their influence to create positive peer pressure to let bullies know that their behavior is no longer acceptable. Encouraging student leadership to create an atmosphere of inclusivity by reaching out to students perceived to be “Loners” to show they are loved, appreciated and an important part of the school body. These unique prevention strategies have been incorporated in the Deterrence component of current school security strategies developed by On Guard International LLC. In addition to Deterrence, the Detection and Defensive elements include: a holistic Vulnerability Assessment and Risk Analysis; incorporating analytics based predictive software, cameras, sensors and access control to provide the school administration with a real time Common Operational Picture; developing comprehensive policies and procedures based on clearly defined job descriptions that clear outline duties and responsibilities; and providing teachers, staff and First Responders with an annual training plan that incorporates realistic scenario based training. The overall goal is to establish real time School Domain Awareness to provide school administrators with the means to sustain school safety at the highest level. He developed the Deter, Detect and Defend model for designing holistic security solutions. The “Deter ” process begins with a comprehensive vulnerability assessment and threat analysis in order to identify and prioritize risks and develop solutions that allocate resources based on prioritized threats. This saves time and money by concentrating valuable resources on the high risk/high threat areas. Furthermore, the model creates a sustainable high level of deterrence by developing and implementing policies and procedures by incorporating specific job descriptions, assigning responsibility and reinforcing this through ongoing training and periodic revaluations in order to create and foster a culture of security awareness. As part of the “Detect” process, he continually evaluates “Best of Breed” technology to create a Common Operational Picture that provides real time alerts to system users while simultaneous monitoring hundreds of cameras utilizing state of the art video analytics and predictive software. The “Defend” process counters acts of aggression from criminals and terrorists with a range of proactive options from less than lethal to deadly force. He has served as a security consultant for critical infrastructure, schools, churches, gated communities and condominiums. Has served as the project coordinator for multi-million dollar border security projects bringing together a consortium of security technology manufacturing and service companies to respond to a request for proposals (RFP). These projects included writing a proposal for the security upgrade including training and security protocols for the Bahrain International airport; creating a secure rail corridor at the US/Mexico border for cargo operations; upgrading and restructuring the air space defense systems including intelligence fusion center for the Mexican Air Force; and designing a predictive analytics system to identify suspicious persons for the Benito Juarez International Airport in Mexico. He served as a consultant Mexican presidential transition team in 2012. Prepared senior government executives as leaders of federal law enforcement and intelligence agencies. Locally he has served as a security consultant providing vulnerability assessments and risk analysis as well as designing and writing Request for Information (RFI) and requests for Proposal (RFP) for private schools, condominiums and gated communities since 2013. Provided domestic and international security assessments for airport, seaport and land border cargo and passenger operations. Provided Executive Protection for High Value clients including CEOs of Fortune 100 companies and their Executive VPs in high threat countries. Designed Anti-Piracy Protection System for 650 foot Dredge Ship operating in Nigerian Inland waters. Conducted investigation into five million dollar corporate fraud leading to asset recovery. Served on counter-terrorism protection detail with former members of US Navy Seals (DEVGRU) at 2014 Winter Olympic Games in Sochi, Russia. Responsible for conducting criminal Investigations to dismantle international narcotics, illicit arms, and alien smuggling organizations operating at South Florida, South American and Caribbean Basin international airports and seaports. Subject matter expert on facility and cargo security. Extensive experience in preventing cargo theft and narcotics smuggling from internal conspiracy by corrupt airport employees. Promoted cooperation on enforcement and security with the airport and port stakeholders through the Customs Trade Partnership Against Terrorism (Formerly the Business Anti-Smuggling Coalition). This resulted in the dismantling of a multinational narcotics smuggling ring operating at eight international airports in six foreign countries and the US. Developed relationships among US and foreign government officials and private companies to foster cooperation. Worked with Ecuadorian border police resulting in the dismantling of a Colombian cartel operation at the Quito and Guayaquil International airports resulting in numerous arrests, the seizure of several tons of cocaine. Fostered mutual cooperation with cargo carriers by conducting risk assessments and making recommendations to implement customized security plan assisting in the mitigation of millions of dollars of fines and penalties. Skill in internal conspiracy investigative techniques and employment of informants key to successful investigation of airport ramp employees at Miami International airport (MIA) resulting in 72 arrests for narcotics smuggling and cargo theft. Utilized undercover operations and advanced electronic surveillance to detect and disrupt an international dock worker smuggling and cargo theft ring at the port of Miami. Conducted border security operations along Southwest border targeting Mexican cartel operations. Prepared to lead 150 men and women Port Security Unit into armed combat as a rapidly deployable reserve unit equipped with six fast attack boats. Managed $1.2 million dollar budget and 3.6 million dollars in equipment. Provided armed waterside and shore side security for USNS ships carrying war Supplies in war zones. Developed unit training on advanced small boat defensive tactics and shore side security entry check point and perimeter defense operations. Responsible for managing Congressional liaison, International Relations and Public Affairs for all Coast Guard commands from the Rocky Mountains to eastern Russia to the Middle East. CG Project Officer for Operation Enduring Friendship providing 16 million dollars in fast boats, equipment and training to Central American and Caribbean nations for homeland security operations. Lead exercise designer, planner and on site coordinator for “Operation Trade Winds” 2008 and 2009 training over 600 Caribbean partner nation military personnel in maritime security operations. Led multi-national training teams in 2008 and 2009 that conducted maritime security training culminating in joint exercises for 120 Caribbean partner nation military personnel. CG consultant on the design, equipment and staffing of Maritime Security operations centers for the Bahamian Coast Guard and the Dominican Navy. Deconflicted interagency narcotics, weapons and terrorism investigations in 42 million sq. mile Joint Area of Operations (JOA). Utilized experience to coordinated inter-agency investigations and develop intelligence sharing resulting in maritime and air interdictions of multi ton cocaine seizures and illicit arms. ICE/USCG LIAISON – PROGRAM MANAGER (acting GS-14) (12/05-09/07) Represented ICE Office of Investigations at interagency leadership meetings and on crisis action teams. Promoted collaboration and information sharing among DHS Partners for significant national security events such as visits of Heads of State and international conferences. Led a command consisting of Administration, Supply, Engineering Armory divisions and Mariners Licensing with a total of 54 personnel including officers, enlisted and civilian personnel. Managed 1.5 million dollar budget and 400 million dollars in equipment and facilities. Responsible for administering good order and discipline for 214 men and women. He formed the South Florida Maritime Intelligence partnership bringing together all port stakeholders to share intelligence and plan joint security operations after 9/11. He developed the Port Intelligence Team (PIT) which became a national model, to collect passive intelligence around South Florida ports and critical infrastructure. He created Operation ON GUARD, a “neighborhood watch” public awareness campaign resulting in the detection and apprehension of Sayed Malike, a suspected terrorist at the port of Miami in March 2003. He conducted an in depth maritime threat assessment for all of the South Florida ports and developed an intelligence capacity to provide Maritime Domain Awareness covering multiple threat vectors starting from inside the ports and extending out to include high risk ports. Assisted in the design and layout of the Coast Guard’s first operational command center at Port Everglades. Worked with CG R&D Center to develop and test Cat’s Eye, a day/night Surveillance system to provide live images into the command center. Led implementation of Maritime Transportation Security Act (MTSA) for cargo facilities, Container terminals and cruise ship passenger terminals at all South Florida ports. Conducted foreign port assessments in the Dominican Republic and Haiti in accordance with the International Ship and Port Security Code (ISPS) in response to high risk threats from narcotics and human smuggling and stowaways. Provided intelligence on the piracy/hijacking of M/V MARGOT from overseas human sources. Assisted with planning for the armed assault by joint agency special response boarding teams and led team in negotiations with the vessel hijackers resulting in the unharmed release of all hostages. Responsible for Federal investigation and coordinating clean up response to significant maritime incidents and marine casualties in South Florida including oil and hazardous chemical spills, vessel collisions, and groundings. Assisted Chief of Port Operations with implementation of increased security at South Florida ports. Assisted in increasing port security presence at South Florida ports immediately after 9/11: established security zones to protect South Florida ports and critical infrastructure, such as cruise ship passenger terminals, container terminals and nuclear power plants established area security committees to share unclassified information with interagency partners and private sector stake holders trained and incorporated Florida National Guard personnel as armed presence at South Florida ports assisting with increased security measures at cruise ship passenger terminals and at port entry check points. Assisted in developing the Sea Marshall program providing armed escorts on merchant ships. Reviewed Federal Port Security grant applications from South Florida ports reviewed ship and facility security plans for Coast Guard approval. Member of Secret Service Jump Team conducting fixed point security at owner’s booth at NASCAR Daytona 500. Liaison with State and local law enforcement and NASCAR security. Stand in for President George W Bush as a decoy as Presidential train entered campaign stops. Flew counter-drug air interdiction missions in the Florida Straits, Caribbean and Central and South America utilizing radar and sensors to detect and interdict narcotics smuggling aircraft and vector in host nation military aircraft to force aircraft tot land or shoot them down. Obtained pilot’s license with single and twin engine fixed wing hours and conducted hundreds of hours of ground surveillance support for criminal investigations. Developed Operation Red Dog, an intelligence collection operation using twin engine aircraft to transport K-9 handler and drug dogs to conduct airport ramp checks at civil aviation airports in the early morning hours.